I get up in the morning and it is dark. Then, before I know it, the sun has set and it is not even 5pm…. by dinnertime, I feel like it is already past midnight. And it is cold! I am writing this as I sit on the floor next to (and not on) my sofa: you might know that fidgety feeling. When you have exhausted all humanly reading poses, suitable for studying, and you resort to crouching, headstand (for those capable of) or with your feet on the wall… you get the idea. It has been a long week for me already – yet it is only Wednesday – and so I thought that I might not be the only one in a dire need of some creative distraction. What a better way to do that, than share with you some things that are around this time a year. They just started selling those in Albert Heijn a couple of days ago – for 15 euro you can travel any Friday after 18:30h till 4am on the following Monday morning. The offer is valid 15 November through to 29 January 2017. If you do not have one of those weekend deals already, this is the perfect time to consider exploring the Netherlands. For some 15 euro you can change as many trains within the Netherlands as you want. The full terms and conditions you have to read carefully yourself on the tickets. You also get a free coffee from Albert Heijn-s which have the to-go coffee machines. I just got mine, it works. Both for the coffee and the train ticket (I went to Zeeland). Planning on getting another ticket for the upcoming weekend too! To give you some thumbs up – do check for track renovations on the NS website if you don’t want unpleasant surprises with transportation. Christmas is a month away but trees are still pretty, don’t you think? Leiden University students organise some pretty cool plays this time of year. You might have seen them sell tickets by the entrance of the Lipsius building. This year, they are holding a Christmas play, three days in December. I haven’t seen this one yet (I am going to) but it is in English and looks quite promising. I went to another such event back in Winter 2014, and I have been looking forward to attending again ever since. You can find the link to their page here. This is not exactly an event until the Christmas markets open (which they do later on in December) but you can look for it on the menu. In this season to have a warm aromatic cup of it in your hands can be priceless! Or you can opt for a hot chocolate if you don’t drink alcohol. Either way, makes you feel all warm and fuzzy on the inside! If you want to see German christmas markets but do not want to go to Germany – it might be an idea to get the train to Limburg province – and enjoy it from there. Don’t we all sometimes need a break! PS. It was just pointed out to me it is a Thursday…. ouch. Said mulled wine…. and the AH train tickets! 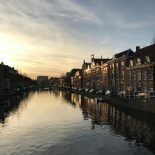 This entry was posted on November 30, 2016 by antoaneta@theleidener in Leisure, Living in Holland, Practical Stuff, Uncategorized.